I'm a fan of simple backpacks and travel bags that aren't subdivided into a bunch of smaller compartments. You can stuff bigger things into them because all the space is available. Loaded up, you have less dead space from the cumulative unused space of several compartments. You're not paying for, and losing valuable real estate to, specialty compartments that you don't need (e.g. you're giving up a lot of real estate for that dedicated laptop pocket if don't actually carry a laptop). And they're lighter. But there are disadvantages as well. Your stuff simply gets more disorganized in a single, big compartment. All the small stuff works its way to the bottom and it's a pain getting to it when you need to. So when I'm carrying a variety of small things, I like to have smaller bags to organize related items and then put those into my pack. That keeps things more organized. If I don't need those items on a particular trip, or I have a really big item that takes up all the space in the main bag, I can just leave the little organizational bags at home. Of course, there is still the added effort of opening and closing two bags when you go to retrieve a small item, but the flexibility is worth it to me. 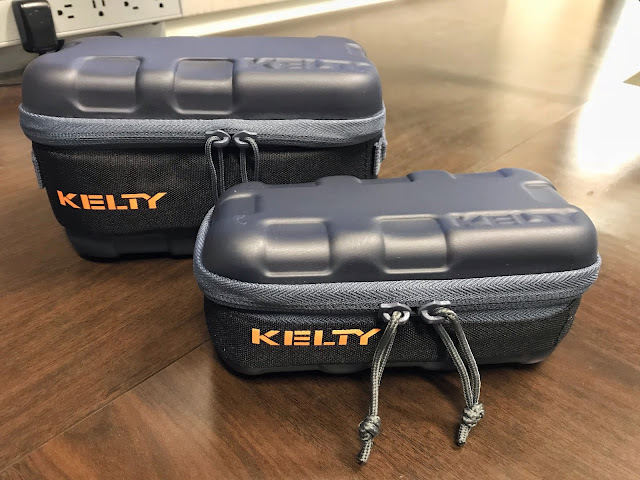 I recently saw these Kelty Cache Boxes on sale and they seemed pretty ideal for organizing smaller items. So I bought one of each size – small, medium, and large. The lids and bottoms of the Boxes are made from a rubberized plastic. The sides are made from heavy cordura, reinforced so that they're rigid. A zipper goes around 3 sides of the perimeter so that the whole lid hinges open, exposing the entire inside and making it really easy to get at the contents. The materials and construction quality are reasonably good, but this is not a Pelican case. But it also costs a heck of a lot less. I like the semi-hard shells of these Boxes. They provide a bit more protection from shock and puncture than a cordura bag, but they're also very light so they don't add much incremental weight to your pack. I find them a livable compromise between protection and weight/bulk. The 3 sizes are handy and they work great for my purpose of organizing the contents of a larger backpack or shoulder bag. Like a camera bag, each Cache Box comes with one or more padded dividers (depending on size) that are velcro'd to the inside so that you can partition the space as you see fit. The Cache Box also comes with a little internal pocket to hold really small items, an elastic cargo retaining strap, and a mesh sleeve in the lid. All of these features add a bit more organizational capability to my single-compartment backpack. 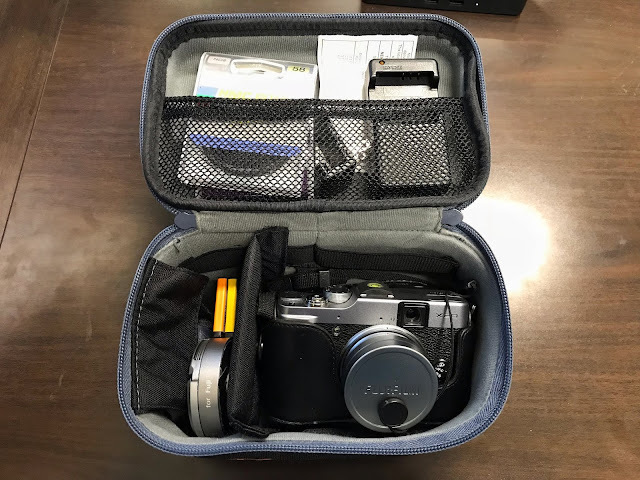 With the padded dividers, the medium and large Cache Boxes make a pretty good photography case that can be carried inside regular, nondescript travel bags that don't scream, "Expensive Camera Inside!" One thing I really like about the Cache Box is that I can store all the pieces of a related kit together and then transfer the whole enchilada easily to another bag whenever I need to. 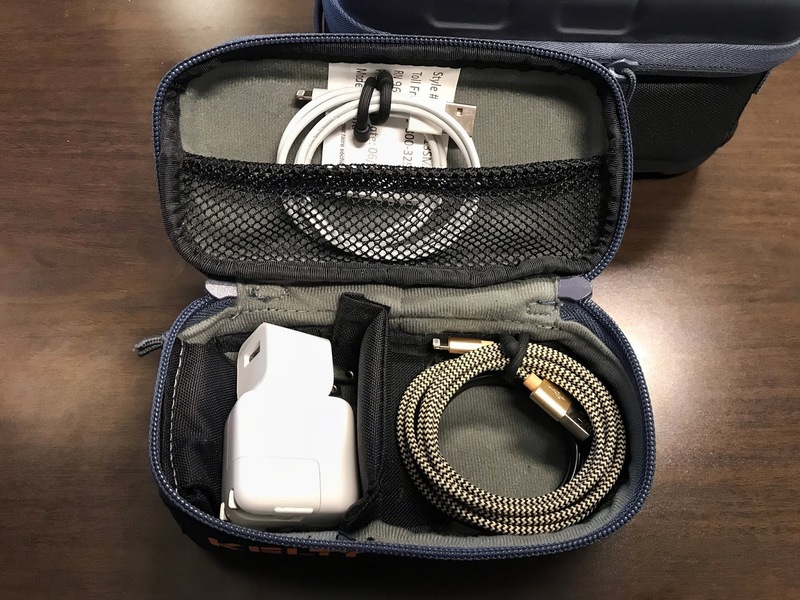 For example, I put my minimalist, carry-everywhere camera kit into the medium-sized Cache Box, and now I can move the entire kit from, say, my commuter messenger bag to my travel luggage in one easy step. It's very convenient. Are there downsides with the Cache Boxes? Yes, but they're fairly minor. First, the elastic retaining strap can get in the way depending on what you're trying to store in the Box. The strap is handy for keeping cargo from rattling around in the Box, but if you don't need the strap, it just gets in the way. In that case it's easy enough to just to cut it out of the Box, but that's an irreversible solution. Other issues? The mesh sleeves aren't snug against the lid so they don't secure really small items very well. And one drag is that the small sized Cache Box is just slightly too small to hold my iPhone 7. The prices on these are quite reasonable. They go for around $9 to $25, depending on size. To me, that's a very fair price for the level of quality. In other words, you can find cheaper solutions that aren't as well made and you can find more rugged solutions that cost a lot more, but the Cache Box strikes a happy medium. For me, anyway. All in all, I'm pretty happy with the Cache Box. If you need a way to organize your commuter, hiking, and travel bags, I recommend checking them out.